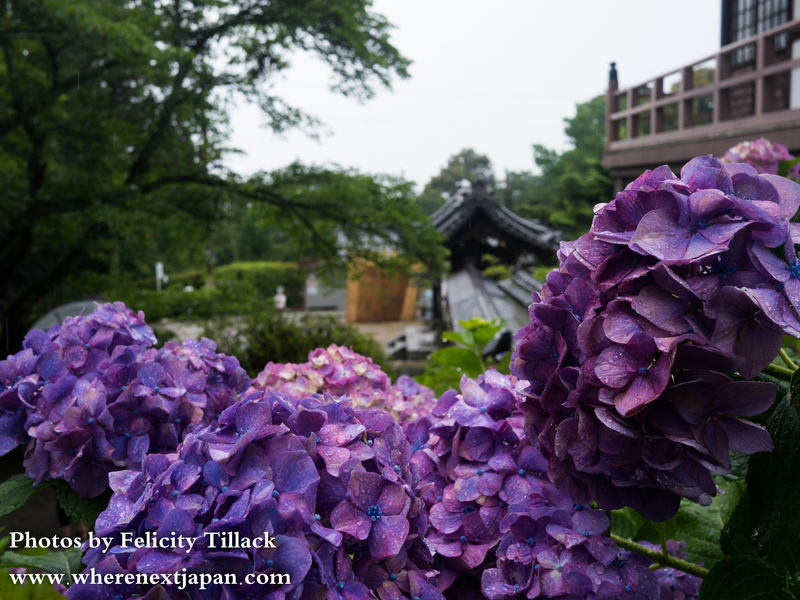 Visitors brave the rain for hydrangeas in the gorgeous gardens of Iyata Dera, Nara. June in Japan means the beginning of the rainy season; the beginning of a hot, humid summer; it means fireflies, and finally packing away the kotatsu blankets, and rediscovering the collection of uchiwa hand fans stored from last year. 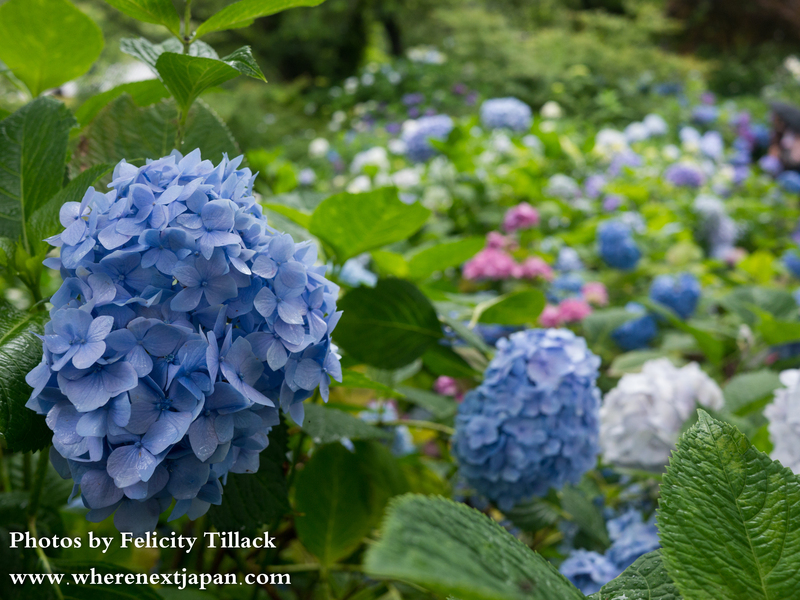 June is also the time to see ajisai, hydrangeas in all their pastel purple, pink, blue and white prettiness. Wild, along roadways, or gardened into gorgeous, sharp-intake-of-breath displays, they are part of the Japanese seasonal cycle, and crowds pilgramage to see them as they would sakura cherry blossoms or momiji autumn leaves. A natural model poses with a beautiful backdrop. Yatadera (矢田寺) in Nara prefecture is famous for its flowers and its Buddhist statues. The daien main garden is not only wall-to-wall flowers, but multistoried – the path twisting through the up-close undergrowth, then up stairs to enjoy a wider view. Surrounded by flowers on the lower path. Because ajisai bloom during tsuyu rainy season, damp weather doesn’t deter crowds. If anything, people were more keen to capture early summer’s true essense even if sometimes walking was a little slow, and taking photos and awkward juggling act. The rain made a small waterfall on the stairs. Beyond its daien, Yatadera is a wide temple complex, with lots of interesting buildings and areas to wander around, and uncover the many ojizo statues it is famous for. The walk up to the temple gates is lined with small shops, selling local vegetables, toys, and tea. For someone looking for slow, meandering daytrip, there are lots of opportunities to stop and relax. One of the interesting things we found when visiting Yatadera, was that the first paid parking lot was only 300 yen, but a few 100 metres along the price jumps to 500 yen. For an extra 2 minutes of walking, the cheaper price and shorter waiting time is worth it. There are also buses available from Koriyama station, or Yamatokoriyama station. Entry to the temple is 500 yen. Hydrangea is my favorite flower and I so enjoyed your great photos. I like that you put people in them too! Blue ones are my particular favorite!! Do you sell your photos? Hey Leah! Thanks for your lovely comments as always ^^ I wish I could sell my photos – I don’t think I’m good enough yet though, and there’s such a huge amount of people to compete with these days. Hydrangea are a favourite of mine too – though they aren’t as big in Australia as they are here. AUstralia? I come from the U.S. but it’s been 42 years so i don’t know what is happening there. I look forward to you posting another video adventure with you in it! !